Chord Keeper is designed to be all-in-one application for the mobile platform to help you organize your music notation, in whichever form you would like it to be captured. 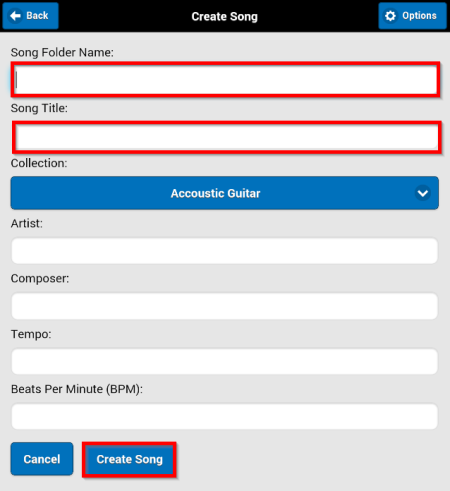 If you would like to capture chords for songs you play, sheet music, lyrics or all of the above, you can organize them in this app! Chord Keeper does not try to bring the world of music from an online music service to your device but to take your personal music you play and help you archive it electronically. As musicians, we’ve collected many beloved scores and songs, some of which are our own; the goal of this app is to put it all together in one easily accessible library. For this reason, the music in Chord Keeper is a very personal. The app is not intended to store someone else’s chords or scores, but your very own music you play. More features will continue to be added to this app so check for updates! Skim through the sections below to find some tips to help you manage and organize your music artifacts. When you first launch Chord Keeper, and if this is the first time running this app on the device, it will attempt to create a new library with some samples. You can then add your own music and delete or keep the samples. Currently, each song is associated to a collection. Selecting a collection shows the songs you have within it. Tap on a song to go into the Song Screen. 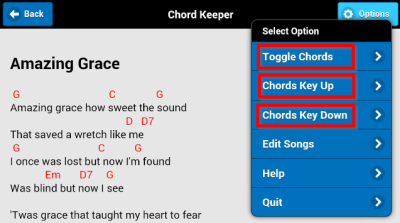 In Lyrics and Chords view, you can toggle chords on and off by using the “options” menu. Chords can also be transposed up or down by half tone. If lyric text is long, the “scroll” option in bottom menu can be used to auto-scroll during a performance. Pressing the “stop” button will stop scrolling. You can zoom in and out within the lyrics view. Finally, for full screen display of your lyrics, tap the lyrics anywhere to show and hide the top and bottom menus. NOTE: Transposing your chords in Lyrics View and Chords Only view DOES NOT save changes to your song. Once you re-open the view, chords will be returned to original key. If you have sheet music within your song package, this option is available. Score pages will be displayed full screen in the order specified in edit mode. Tapping anywhere on the right side of the sheet will move forward a page, tapping on the left side of the sheet will go back to previous page. On an Android device, press the device back button to exit out of sheet music view. You can also use a bluetooth page turner device to flip pages. In some situations, you may not want to see the lyrics with chords, but simply the chords only. 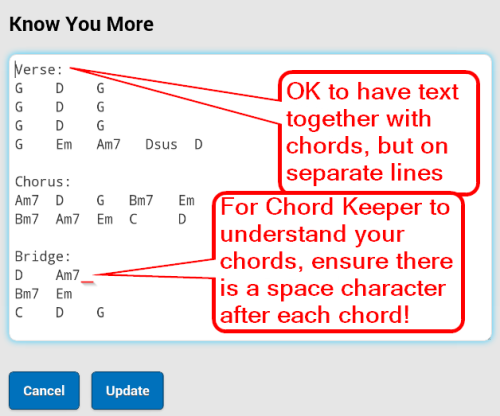 Chord Keeper will format chords into columns and try to detect the difference between chords and other text. Chords can also be transposed and viewed in full screen mode as in lyrics view above. In this screen, any recordings created via the recordings edit screen or imported to your library can be viewed here. Useful during a performance for one-man-band gigs. TIP: You can start playing a track and with one tap display the lyrics, sheet music or chords! The next sections will provide some tips how to create and edit your song packages. To jump to editing your songs or collections, select the “Options” menu on top-right and select “Edit Songs”. 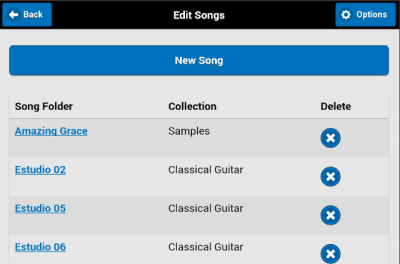 You will be presented with an option to edit collections or songs. 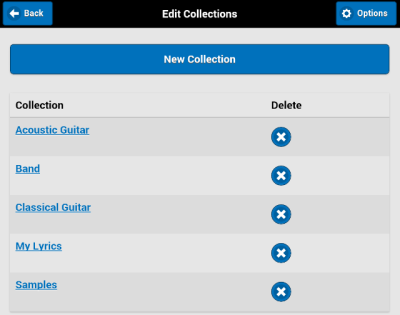 In this screen, you can create new collections, rename collections or delete collections. Deleting a collection will not remove the songs in it. Songs will simply be un-associated with the collection. This means you will not be able to select this song in the Home screen. Simply go to edit the song and select a collection to put the song into. Editing a collection does not currently update the songs in the collection. 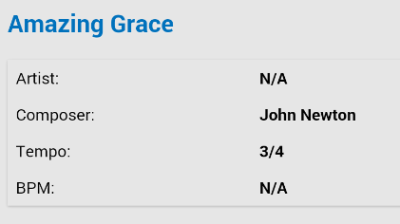 This will be addressed in future update of the app. Currently, you’ll need to go to the song and update it selecting the proper collection. TIP: By default, collections are sorted alphabetically. Sort order can be changed by tapping on the “Collection” table header. To create new song packages or editing existing, select the “Options” button in top-right of your screen and select “Edit Songs”. Then press the “Edit Song Library” button to edit the songs. Below screen will be shown. From here, you can click the “New Song” button to create a new song. Also, clicking on an existing song will bring up the edit screen for that song. Deleting a song will delete it from the library but not from the file system on your device. To permanently delete a song, you must delete it from file system using a file explorer app after you’ve removed it from your library. Create a new song by pressing the “New Song” button. When creating or editing a song, the only fields that are required are the “Folder Name” and “Song Title”. Chord Keeper will create a unique folder for each song (i.e. package) and all your artifacts for that song will be in that folder. The folder name is also like an alias or short name for your song. It’s what is displayed on the home screen when you select a collection. In the above screen you also associate the song package to a collection. Once you create the song, it will be in the song library but it will not have any artifacts. 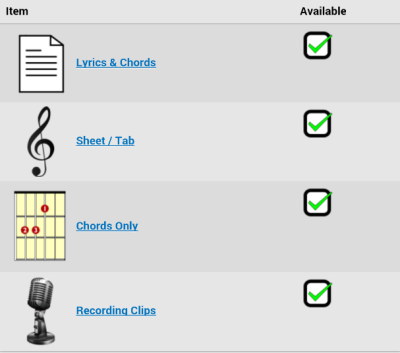 The next sections show you how to add chords, lyrics, sheet music and recording clips to your song package. To add or edit Lyrics and Chords of your song, select the “Options”menu at the top and then select “Edit Songs” to go into edit mode. Then press the “Edit Song Library” button. TIP: You can sort songs by collection or folder name by tapping the table header in the song listing view. Create a new song by pressing “New Song” button or edit an existing one by tapping on it’s name. You will see a screen similar to the “Song” screen but here you can edit all artifacts of your song. Tap on the “Edit Lyrics and Chords” text to update them. 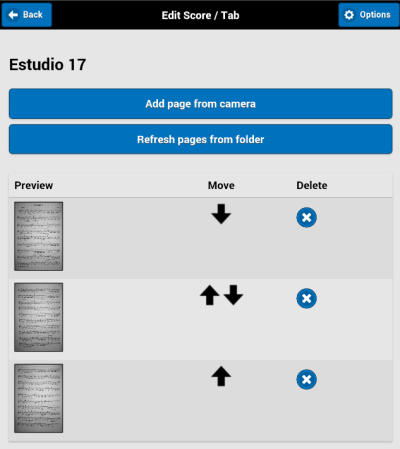 Although you can edit all artifacts within Chord Keeper’s editor interface right on your device, you may want to use your computer to import or edit certain items in your library. Below sections discuss how to do this with iOS and Android versions of Chord Keeper. You will need a program on your Mac or PC that can access your iPhone or iPad file system. A great program for this is: iFunBox which is also free. Here is how to use it. Connect your iPhone or iPad to your Mac or PC and launch iFunBox. In the left portion of the screen you will see a list of applications. 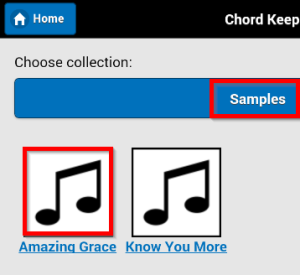 Find Chord Keeper and click on it. Then on the right side you can double-click to navigate to appropriate folder and simply edit or drop in files as shown below. 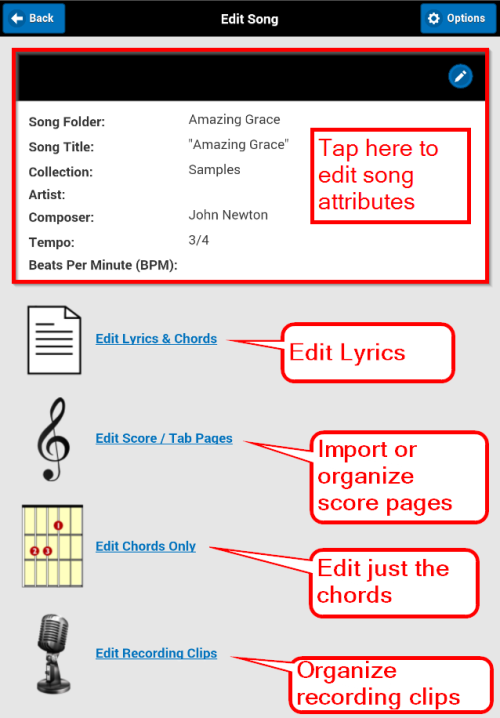 To add or modify sheet music pages for your song, go back to edit mode and as shown above, select the song to modify and tap on “Edit Score / Tab Pages”. The above scree will show the sheet music pages you’ve created for the song. One way to import sheet music is taking pictures of you pages using “Add page from camera” option. Once you take a picture, it will give you the option to crop it and will import it to the list. The file will be archived within you ChordKeeperData library, not in your photos library. If you press “refresh pages from folder” button, it will add pages that exist in the “score” folder on your device. This way, you can scan in pages or add your pages directly from your PC and import them to the song package. As an example, for the song above, here is location of the score for “Estudio 17” on my device. You can drop in .JPG or .PNG files or any image format Android understands into the “score” folder of your song package, and use the “refresh pages from folder” to add to you song package. 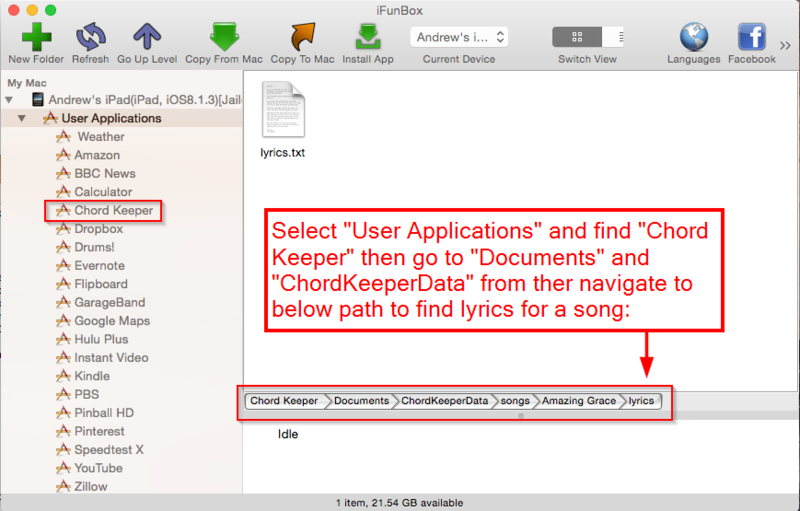 Within “Chord Keeper” app there is a “Documents” directory and within it is “ChordKeeperData”. Drop in your sheet music image pages into the “score” folder of appropriate song folder above. Make sure to restart the app on your Apple device to refresh the file system. Then within the “Edit Score” screen in Chord Keeper select “refresh pages from folder”. NOTE: Pressing the Apple “home” hardware button does not restart an app but simply brings it to background. In order to shutdown and restart an iPad or iPhone application, double-press the hardware “home” button and slide “Chord Keeper” up to close it. If you would like to capture just the chords for your song, this is possible. NOTE: Chords in the Lyrics View are separate from the Chords Only View. TIP: Ensure that there is a space after your chord! 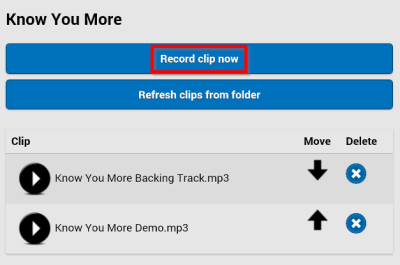 You can also use the built-in microphone of your device to record a clip and have it directly added to your song package by tapping “Record clip now” button. A recorder will be shown, press the “Start Recording” and “Stop Recording” buttons to add a recorded clip o your song package. The clip will be directly in the “recordings” folder of your song package. 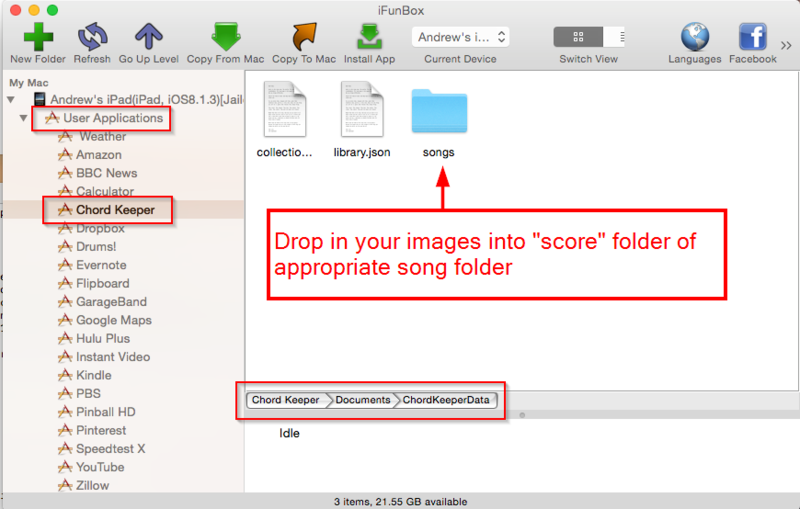 It is also possible to drop in your backing tracks to the “recordings” folder and pressing “Refresh clips from folder” will add those files to your song package. Chord Keeper is an active project so keep an eye for updates and new features in Apple and Google Play stores!